This new recipe puts a healthy chicken & veggie dinner for two on the table in just 20 minutes, using only six main ingredients! Bring a large skillet sprayed with nonstick spray to medium-high heat. Add chicken, and season with 1/8 tsp. each salt and black pepper. Add veggies, 1/2 tsp. garlic powder, 1/2 tsp. onion powder, and 1/4 tsp. oregano. Cook and stir until chicken is cooked through and veggies are soft, 8 - 10 minutes. Remove from heat, and stir in dressing. 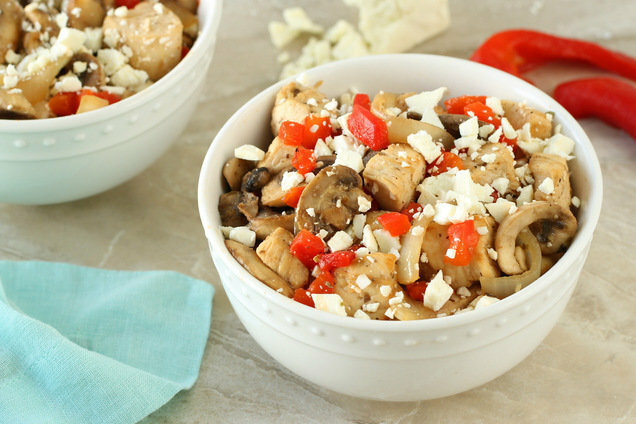 Serve topped with peppers and feta. Hungry for More Healthy Dinners in a Hurry?